NOTE1 : Some of the pictures may be a little different than what you see. Ask for help if you need it! NOTE 2 : IF YOU HAVE TROUBLE READING THIS SCREEN, ASK FOR OR GET A COLORED SCREEN COVER FOR YOUR MACHINE. open a MS Word stationery template (model). write and save a short letter using your stationery. modify the template style and adjust the margins. print a copy of your letter. review the math involved in the process. save your stationery as a template to use again. When you complete this task, you will evaluate yourself. You will complete a Rubric (Self-Evaluation Form). Read the Rubric and the Checklist before you begin. Then return to this page. TO KNOW WHAT IS EXPECTED OF YOU, CLICK THE ARROW TO GO TO THE RUBRICS AND CHECKLIST. STEP 1 - READ THE PASSAGE BELOW AND FOLLOW THE INSTRUCTIONS. If you don't have a blank, white screen showing, go to FILE -> Press "NEW' and click on Blank Document in the window that appears. Notice the icons (pictures) and words on the menu bar. They all do different things. You can play with them all you want. Go ahead and try different things. Type in some words. How can you delete (erase) them? How can you move text to different places? How can you change the size, the look, and color of your text? If you want to develop a small project using those options, CLICK HERE to complete the "Word Title" Task. When you finish, return to this task. Microsoft has a number of templates (models) that you can open in Word and modify. Click on the link (underlined blue letters) below to go to the Microsoft Template Gallery. When the page opens, follow the instructions below. Letterhead with blue theme and matching size 10 envelope (4 1/8 x 9 1/2 in). When that selection opens, you will be able to see what the stationery and envelope will look like. See the image below. Click on the words "EDIT IN MICROSOFT WORD." The template will open in your Word program. That way, you can change it and save it to use again. Go to FILE -> Save As. 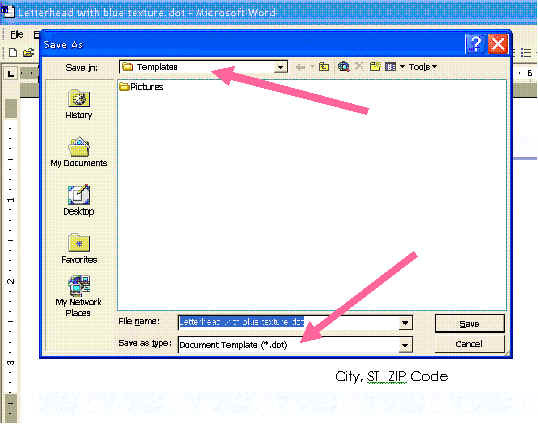 In the box that opens, select Document Template from the "Save as type" window. Now your stationery and envelope are saved on your computer. Now you are ready to make the template your own. As you make the changes, save your work often. To save, click on FILE -->>Save. Your work will be saved in the the Template Folder automatically. Remember that you are now working on your computer, in Word. You are no longer on the Internet. -->> NOTE: If you still see a window that gives you choices for New Documents, close it by clicking on the "X" at the top right-hand corner of the small window. Be careful - DO NOT close the Red X at the top of the program. If you do, open Word again, click on "New," select General Templates, and click on the the template you just saved, "Letterhead with blue theme." 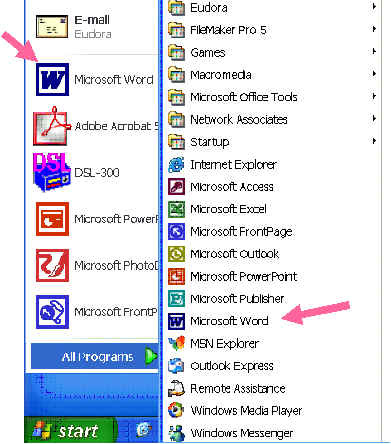 If all else fails, and you are lost, click on the icon (image) on the right to open the template in Word. When the template opens, save it. Use the instructions above. Now you are ready to make changes and personalize your stationery. The first part of the document shows you an envelope. You will print that envelope later. Where you see the options for address (like those on the right), you will change them to your name and address. To change the information, click your left mouse button to the right of each line. Hold the button down and drag it across the line you want to change. Simply type in your name. Follow the same procedure with all of the other lines at the top of the envelope. If you are ready to send a letter, you will also fill in the name of the receiver as well. Go to the stationery (letter) section. Read all of the instructions that are there. If you don't understand some of the words or sentence, ASK FOR HELP. It is the smart thing to do! If you want to remember the instructions, print a copy of the document before you make changes to it. The top part of the stationery has a few shaded lines. You will not fill in those areas until you are ready to write your letter. At that time, you will click in the shaded area and insert the receiver's information there. The date is inserted automatically. Don't worry about changing "Dear" and "Sincerely." Those will always be the same in your letters. You know, like "Dear John, you treated me wrong, so I'm leaving you. Sincerely, Susie." or "Dear Mrs. Smith, you've won a million dollars! Sincerely, Scam Artist." 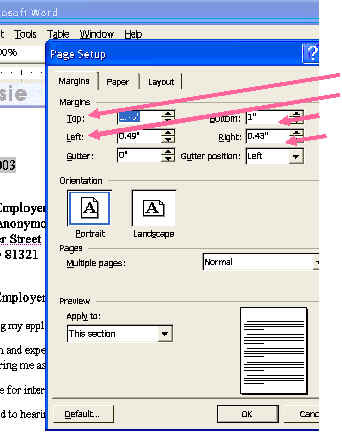 As you look at your document, you'll notice two areas that you can't change just by clicking it them. They are called "headers" (top) and "footers" (bottom). When you fill in the information in those areas, that text will be repeated in every page of the document. For example, if your letter has three pages, that information will be repeated on every page. To insert your information in the header or footer, select "VIEW -> Header and Footer. NOTE: If you don't see that selection, click the chevron sign to see more options under "VIEW." Notice the arrows on the right. To open the footer, follow the same procedure (VIEW -> Header and Footer). When both areas are complete, click on View --> Header and Footer to return to the body of the letter. If Susie Cusie were creating her stationery, the footer would look like the image below. You now have your own stationery, and you are ready to make some changes. Place your cursor (I) (click the left mouse button at the beginning or end of the text you want to delete. Drag the mouse across the text (highlight), and press the delete button. If you don't get all of the text you wanted, repeat the process. If you make a mistake, simple click on the back arrow on the task bar and start over. That is the "UNDO" option. To undo a mistake, you can also hold the "Control" key and press the letter "Z" on your keyboard. Remember that practice is the key to learning a skill. The more mistakes you correct, the better you will learn the skill! If you have difficulty typing the letter, click on the arrow below and the letter will open in your Word Program. You will need to change the header and footer to your own information before making other changes. NOTE: If you are not familiar with Word, complete the "Word Title Task" before continuing. Follow the arrow to that Task. We are now going to change the margins (spaces on the sides and top/bottom of your stationery. Click in the letter that you have just finished. A window will appear showing the present margin settings for the top, bottom, and left and right margins. Click inside each little box (or use the arrows to increase the numbers.) Change all of the margins to 1, or to one inch on every option. Print your letter and place it in your folder or portfolio with all of the final changes. After you print your project, delete all of the text that you entered into the letter (Leave the parts that are shaded.) Make sure that your last "SAVE" is saved as a template so that you can use it over and over again. You may need permission to save your work on the computer. Ask before you finish the project. CLICK THE ARROW TO GO TO THE EXERCISE. STEP 3 - EVALUATE YOUR WORK.